Databases are a "usually large collection of data organized especially for rapid search and retrieval (as by a computer)". Basically, a database is an electronically organized catalog, index, and container for published information such as journal, newspaper, and magazine articles, as well as ebooks, streaming video and audio files. A database is either general or subject/discipline specific and is searchable by keyword, subject, author, or title. A library database will provide scholarly and peer-reviewed sources that are appropriate to use for academic research and writing. The box on the right is a list of some of the most popular general use databases that SC4 subscribes to. If you need help searching the databases, please ask a librarian! "Database." Merriam-Webster.com. Merriam-Webster, n.d. Web. 13 Apr. 2017. Image: "AAA Shared Resource Guide." Indiana University, 2015, iupui.campusguides.com/c.php?g=270710&p=1853046. Accessed 21 Mar. 2018. Most databases are searchable by keyword or subject. 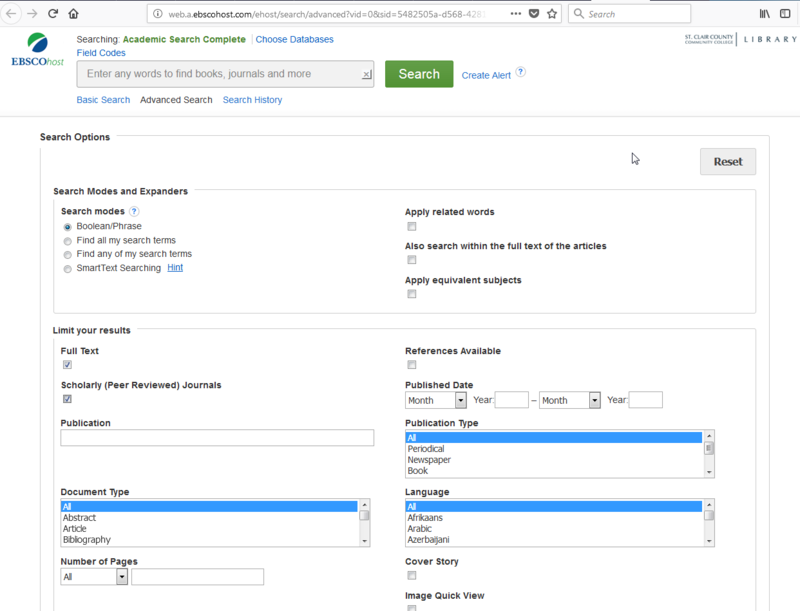 As this image from Academic Search Complete's advanced search shows, you may search using Boolean operators or by searching for any or all of your search terms. You can also narrow down your results by publication date, by publication type, by full text, and by many other limiters. Results can be refined by language, author, document type, or others. 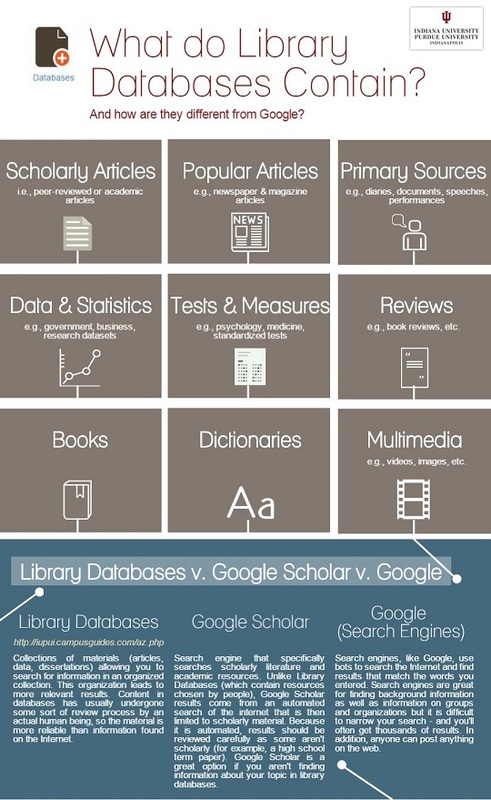 Some databases mix scholarly and non-scholarly sources, and will allow you to limit between the two. Citation: Includes only the article citation (i.e., author, title, date, etc.). Neither an abstract nor the full-text of the article are available. Full-text: Includes the citation and full-text article. This may be in HTML, .pdf, or both formats. Nearly 6,600 active full-text journals and magazines. Nearly 6,000 active full-text peer-reviewed journals. More than 4,000 active full-text peer-reviewed journals with no embargo. Nearly 4,000 active full-text journals indexed in Web of Science or Scopus. CQ Researcher is noted for its in-depth, unbiased coverage of health, social trends, criminal justice, international affairs, education, the environment, technology, and the economy. Reports are published weekly in print and online 44 times a year by CQ Press. Access to online reference books including encyclopedias, dictionaries, biographies, quotations, and more. Contextual information and opinions on hundreds of today's hottest social issues, featuring continuously updated viewpoint articles, topic overviews, full-text magazines, academic journals, news articles, primary source documents, statistics, images, videos, audio files and links to vetted websites organized into a user-friendly portal experience. ProQuest Central is a full-text database with thousands of periodical titles and millions of full-text articles available. It also provides access to information such as: Hundreds of important, full text U.S., Canadian and international newspapers including full text of The Wall Street Journal and Los Angeles Times; more than 50,000 full text dissertations in the areas of business, psychology, physical sciences, health, education and more; concise business information from thousands of market reports across 43 industries in 40 countries; and over 160 subjects are covered by ProQuest Central.